In the midst of battling Titano in downtown Metropolis, Superman can't help but overhear the profound statements of Dr. Emil Hamilton. The good doctor is trying to find the Man of Steel, and who gets in touch with Big Blue better than anyone? Lois Lane, of course. It seems that Dr. Hamilton has discovered that Rao, the red dwarf around which Krypton orbited, didn't super nova, meaning Superman's home world did not perish. Later, after Titano is secured, Hamilton shows Superman live images of Krypton. He questions just who told Superman that the planet had been destroyed. 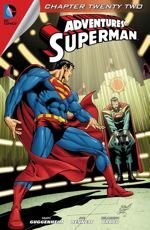 This leads Superman back to the rocket that brought him to Earth, and through which he can communicate via technology with Jor-El, his biological father. 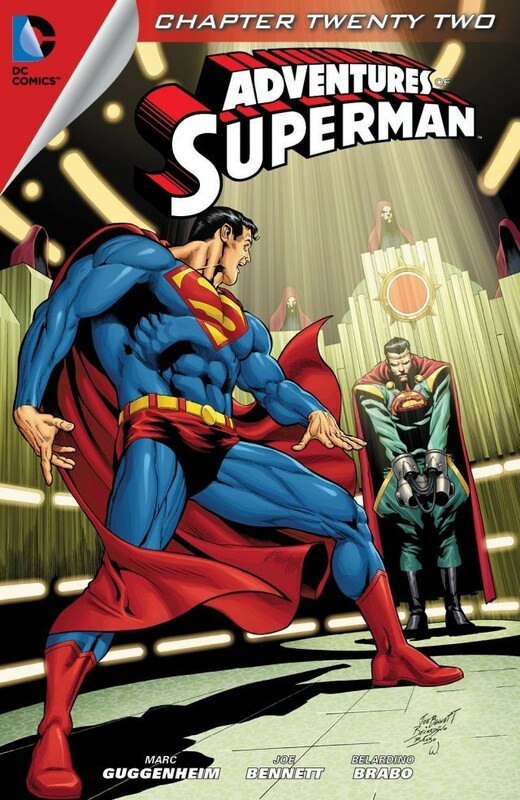 Jor-El's message is the same: Krypton is gone but its legacy will live on in Kal-El, the planet's last son. The only problem is it seems that Hamilton was right. Rao is intact, and Krypton was not destroyed. Story - 4: Color me intrigued! What in tarhoody is going on?! Rao still burning? Krypton still spinning? This is the kind of tasty tale we need more of: a dash of action; a pinch of science fiction; a heaping of mystery. There isn't much to discuss beyond the major plot development that Krypton didn't die. Little else worth mentioning happens, but it doesn't quite matter. I'm certain that it will turn out that Krypton isn't in fact still orbiting Rao, Adventures of Superman being out of continuity notwithstanding; however, the flight that leads to that conclusion is what interests me. The only solid complaint I have is Superman whizzing through the galaxy to see if Krypton is indeed still there. Why wouldn't he have done that before, especially considering the ease with which he got there? If I was told that my childhood home had been eradicated by fire, and it was just a twenty minute bus ride away, I'd likely go check it out, even if I had no doubts about its destruction. That Superman wasn't curious enough to go see where Krypton had once been - again, considering just how easy it was for him to get there - doesn't sit very well with me. Art - 5: Bennett's art is outstanding enough on its own, but have Jason Wright's colors glide over it and you have some sweet eye candy. Bennett went for a slick Curt Swan look for his Superman (Swan reference: main panel, page 8; digital edition), but Wright is the star on this art team. He has a knack for the illusion of making drawn light appear to have brightness. I enjoyed gazing at this issue so much that I've flick through a dozen times to just admire the art. Cover Art - 4: Something's a-foot. We're not yet privy to why Jor-El is shackled, but that'll surely be revealed by the end of part 3. Despite an awkward looking right hand on Superman, this cover does the trick.